Have students try these activities to extend their knowledge and interest in the Constitution of the United States. Ask students to recreate the setting of the Constitutional Convention. Independence Hall was the site of the 1787 convention. Have students construct models of the building and the room where delegates met. Help students locate pictures of the Hall in books and on the Internet. Provide a variety of art materials, such as cardboard, connecting blocks, craft sticks, boxes, and paints for students to use. Who can be a state’s representative in the House of Representatives, a state’s senator, or the president? What are the qualifications for these jobs? Have students read the first and second articles of the Constitution to find the answers to the questions. Ask students to list the job qualifications cited in the Constitution. Then have students identify any other qualifications they think should be required for persons seeking these offices. George Washington served as president of the Constitutional Convention. In February 1788, he wrote his friend Marquis de Lafayette a letter commenting on the convention. 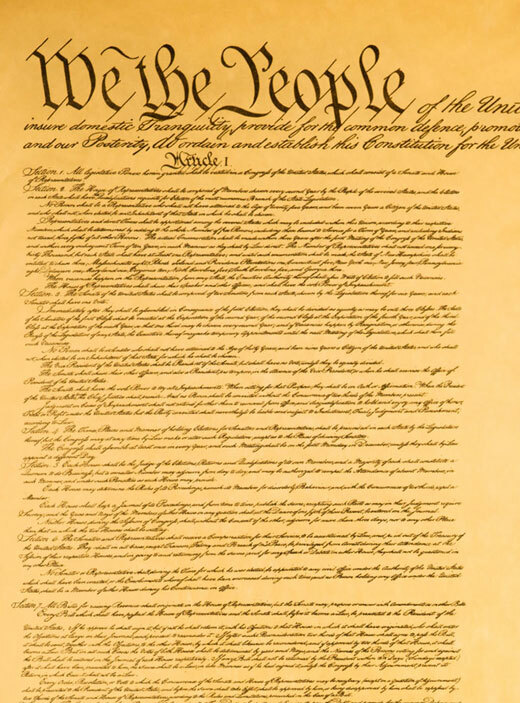 “It appears to me, then, little short of a miracle, that the Delegates from so many different States … should unite in forming a system of national Government.” Ask students to make a poster of quotations about the convention and the Constitution. They can begin with this quotation, writing the message on a sheet of paper, noting its author, and then attaching it to the poster. Then have them add other quotations. Encourage them to find quotations by Americans throughout history. Stand up, salute the flag, and hold a patriotic assembly. Have students prepare a choral reading of the Preamble of the Constitution. Also encourage student groups to choose a patriotic song to perform. They might perform such songs as “America the Beautiful,” “America,” “The Star- Spangled Banner,” “Stars and Stripes Forever,” and “This Land Is Your Land.” Hold a class assembly in which groups present their reading of the Preamble and sing patriotic songs. Help students identify the individuals holding these positions in the federal government: the state’s two senators; their district’s representative in the House; the speaker of the House; the president and vice president; members of the president’s cabinet, and members of the Supreme Court. Divide the class into two groups. Then play a game of Name That Official. Challenge the groups to identify the position held by an official given the name of the official or the name of an official given the position held.